The ultimate long-range precision riflescope, the 4-16x50 features 60 total MOA internal adjustment travel and large 50mm objective lens for maximum light gathering/exit pupil at all magnifications. Mildot reticle is standard. 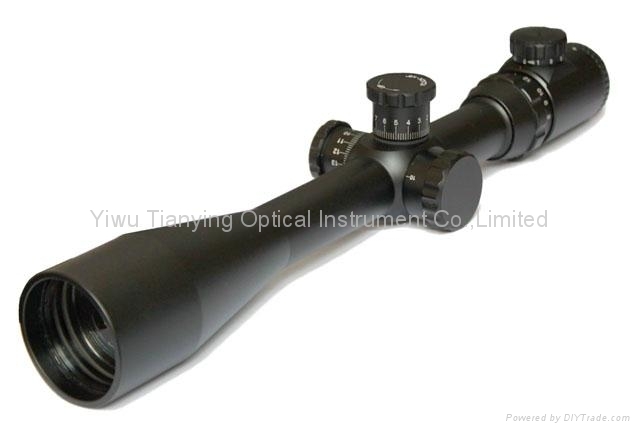 Tianying has engineered the entire optical system to provide the shooter with a bright, sharp and incredibly flat sight picture. Larger tubes allow for maximum resolution, wider windage and elevation travel and superior low-light performance. 3. Milled from aircraft grade aluminum, durability is built into each model. Provides outstanding flexibility for up close as well as long-distance shots. Reticle adjustments are made in 1/4 MOA click-stop moves you can both feel and hear, and with no backlash to make your shot creep off target. State-of-the-art adjustments are precise, repeatable and stay put until you move them. Expert marksmanship requires precision, the King riflescope delivers. Tough body resists corrosion and wear.